2. Gently place the tofu triangles into the pan, wider side down. Heat the tofu for about 5 minutes each side until the side is browned. Don’t move the tofu unnecessarily, because it breaks easily. 3. Note that bubbles forming in the oil around the edges of the tofu indicate that it is getting crispy and that it will soon be ready to turn over to cook the other side. You can also turn the tofu triangles onto their smaller sides briefly to brown those as well, if you wish. 4. 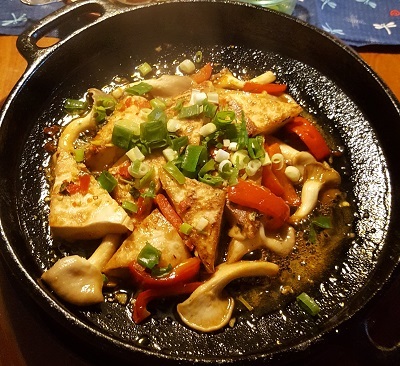 When you think the tofu is sufficiently crispy and browned, add the bell pepper and mushrooms to the pan. 5. You should be able to smell the fragrance of the pepper as it begins to cook. Now add the sweet and sour sauce – pour it over everything. Cover the pan with a lid to keep the flavour in. Allow it to simmer for about 3 minutes. 6. After about 3 minutes, you’ll see that the sweet and sour sauce is evaporating away. Turn the tofu over to help absorb the sauce, and cook for 1-2 minutes more. 7. Sprinkle the chopped green onion on top, and turn off the heat. 9. 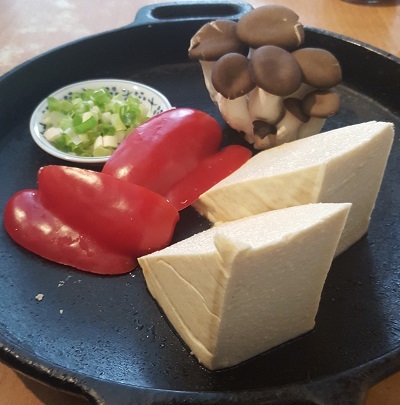 This is ‘iron plate tofu’, so you usually serve it in the pan. Just take the pan to the table and put it on a wooden board or something similar that is heatproof. You can let it cool a little first, if you prefer. 1.You can replace the tofu with chopped fish, chicken or pork. 2. 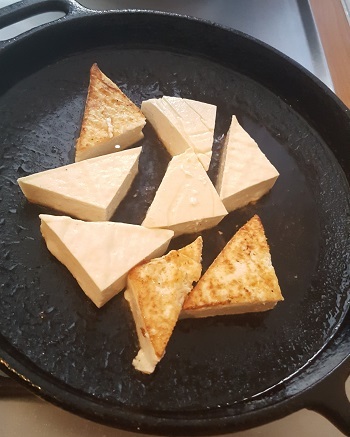 Slicing the tofu into triangle shapes looks nice, and gives it more area to get fried and crispy. 2. You can use various kinds of mushrooms, such as trumpet mushroom, oyster mushroom, button mushroom, shiitake mushrooms, or dry shiitake mushrooms. 3. Bell pepper can be replaced with onion, or carrots. 4. Green onion can be replace with coriander, celery, or basil. 5. In Chinese, the name of this dish is Tie Ban Do Fu, which is pronounced something like ‘Tee-ay Ban Dough Foo’. This can be translated into English literally as ‘Iron Plate Tofu’, or in other ways such as ‘Hotplate Fried Tofu’. In Chinese it is written 鐵板豆腐. The basic style of cooking is very similar to Japanese Teppanyaki.